Following last week’s blog post where we looked at key moments in The Lion King, Inside Out and Toy Story 3, this week we’re taking a look at two more moments that open the floodgates in our favourite animated features. Studio Ghibli are synonymous with powerful emotional stories, from Spirited Away to Princess Mononoke. Miyazaki and his team have proven that they can tug on the heartstrings and create heartfelt features that truly speak to us through the medium of animated characters. This story is about a misunderstood young girl called Anna, an orphan living with foster parents who moves to the countryside to live with her aunt and uncle. She has a troubled home life and is often prone to outbursts and trust issues with parental figures. She has no idea about her past and struggles with her sense of self, at the very young age of 12. She becomes fascinated with a Marsh House in the country, inhabited by a young girl called Marnie. She finds solace in her as they adventure around the old house and become good friends, though Anna is concerned as she keeps waking up from a dream-like state. The film creates a web of mystery, which ultimately results in a powerful moment where Hisako relates the story of Marnie to Anna. She becomes fascinated with a Marsh House in the country, inhabited by a young girl called Marnie. She finds solace in her as they adventure around the old house and become good friends, though Anna is concerned as she keeps waking up from a dream-like state. The film creates a web of mystery, which ultimately results in a powerful moment where Hisako relates the story of Marnie to Anna. Emily blamed her mother Marnie for abandoning her, not understanding her pain, and ran away and had her own child, but she and her husband both died in a car accident. Marnie took care of the child (her granddaughter) for a year before passing herself and leaving her to foster care. That child is Anna. 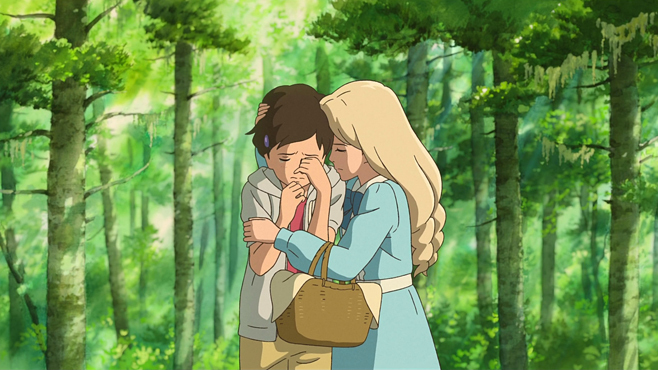 Anna realises that Marnie has been the spirit of her grandmother all along, running in tandem a timeline that connects with Anna to tell her the story of her past. Marnie leaves Anna in a silo (the same one she was trapped in by her neglecting parents and abusive house maids) when she was a child, and Anna can’t understand it. In a dream sequence, the story unfolds that this is largely a metaphor for her own abandonment, attempting to prove to Anna that her family cared for her and loved her deeply, but due to the car crash and her grandmother’s passing she was passed into foster care. In a dream sequence, the story unfolds that this is largely a metaphor for her own abandonment, attempting to prove to Anna that her family cared for her and loved her deeply, but due to the car crash and her grandmother’s passing she was passed into foster care. This revelation asserts some of Anna’s identity. Her mysterious blue eyes, her biological family, it all comes through in an all-encompassing wave of emotion. She goes through a rite of passage full of trauma and grief that she hadn’t yet dealt with, and this impacts the audience in tandem. The way the mystery had been weaved by Studio Ghibli makes the conclusion so deeply satisfying when you can finally understand why she feels so abandoned and ‘outside’ from other children. She WAS loved and not intentionally abandoned like she believed she was. This means that she can move past the pain of her past and channel the positive emotions into her future. She gets home and calls her foster parent ‘Mother’ for the first time, and finally feels like she can get along with her friends. We were all misunderstood once, and the relatable story can resonate in one way or another with anybody. She WAS loved and not intentionally abandoned like she believed she was. This means that she can move past the pain of her past and channel the positive emotions into her future. She gets home and calls her foster parent ‘Mother’ for the first time, and finally feels like she can get along with her friends. We were all misunderstood once, and the relatable story resonates with anyone who has lost a loved one or even just felt like an outsider in their childhood. This naturally creates the tears. A truly human story that is only further empowered by its use of animated characters. A contemporary example but a nonetheless powerful one, Moana is another emotional story of personal growth. A fresh headstrong take on the typical Disney Princess narrative. Moana is born into a hierarchy with the burden of power, much like Simba, Ariel and many other Disney protagonists by nature. The setting is framed as such that people on the island should never leave. Her father, the chief ensures that all of their resources are provided, and there would be no need to change the status quo. He himself had tried to go beyond the reef as a child but ended up losing a friend in his endeavours, which is why he is so protective of his adventurous daughter. Moana inevitably learns that her people used to be voyagers, but since the heart had been stolen they had become insular due to the darkness spreading across the ocean. Her grandmother Tala later passes on after giving her the advice to leave whilst the hubbub around her death has the attention of the island. This in itself is an emotional scene that will resonate with anyone who has lost a loved one. Her dying wish is sincere in that she wants Moana to realise her true purpose and save the island. 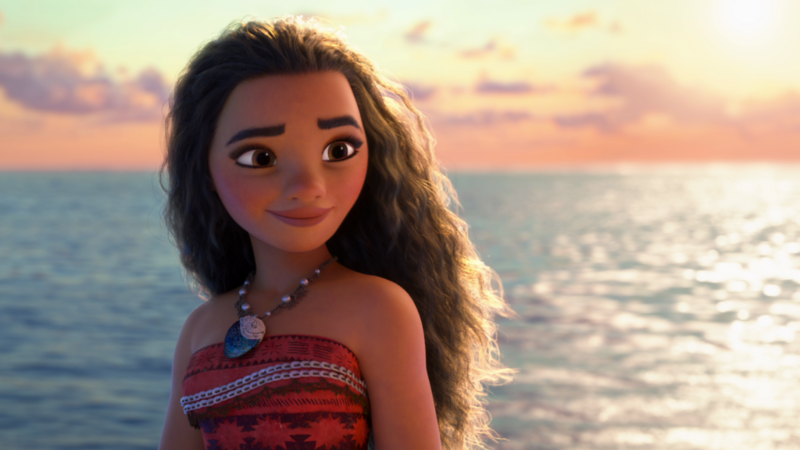 The first person to believe in her has a profound effect on her development as a character when Moana comes back around for its big emotional climax. Distraught at the thought that she’s not good enough, she calls out to the ocean to take the heart back and choose another person. Luckily, her grandmother’s spirit comes back to her and encourages her to find the drive within herself that she’s been searching for all along. Moana realises that the call of the ocean isn’t something to find, that she already owns it, and emboldened by her grandmother’s words she finds the strength to carry on and restore the heart! What I think makes this scene so tearjerking has to be the musical direction. The movie’s main soundtrack ‘How Far I’ll Go’ is worked into this moment, and the melody becomes more powerful as the words change in the refrain. You see the change in the song and the emotional journey Moana has been taking you along finally gets some closure. Moana is now confident in herself and has embraced her curious side. She has proven herself to her family, and Maui, and later goes on to save the day. Like every good animated feature, you can draw parallels to real life passages. Growing up and leaving home for the first time. Deciding to travel away from your hometown.Going against your parent’s wishes for something that you believe in. Disney are the absolute masters of their craft when it comes to commenting on real life issues through the medium of animation, so it’s no surprise to see it here. Moana teaches us to embrace our true selves and move forward through adversity. If you don’t take the risk of swimming out to the reef, will you ever be truly happy? Perhaps sometimes it’s healthy to get out of our comfort zones! Of course, these were just a few of the best emotional moments present in animated features. Tell us your thoughts (or suggestions) on Twitter!